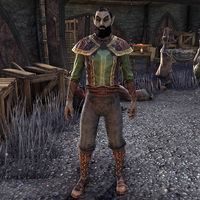 Adras Furari is a Dunmer found in the town of Heimlyn Keep. He can be found at the makeshift camp outside the main gate with other cursed citizens and field assistants after being rescued from his home. His son was taken by the spellplague, which he was there to witness. "Please, help me. My son died before my very eyes. What do I do?" Try to calm down. The totem's aura will protect you. "I'll try. But I'll never forgive the Covenant for my son's death." This page was last modified on 6 March 2019, at 09:00.